Although January has 31 days just like a number of other months, it seems even longer than that to me. It’s cold, it’s dark and it’s dreary. 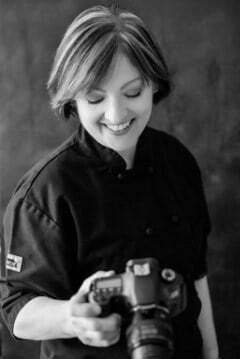 Taking decent food photos this time of year is not for the faint-hearted! Besides the weather, we’re all trying to eat healthier and make plans for the year that lies before us. 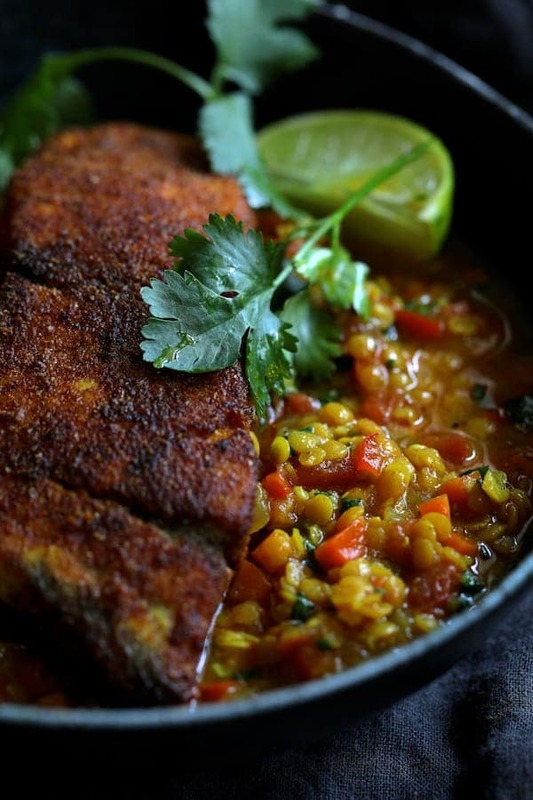 Let’s forget about all that and do something exotic like Indian Spiced Sea Bass with Braised Red Lentils! The combination of spices that encrust the sea bass in this dish packs a real flavor punch. Hungarian paprika is more pungent than regular sweet paprika. Hungarian paprika is available at any grocery store, however if you can’t find it or don’t wish to buy it, use sweet and just add a little more cayenne. 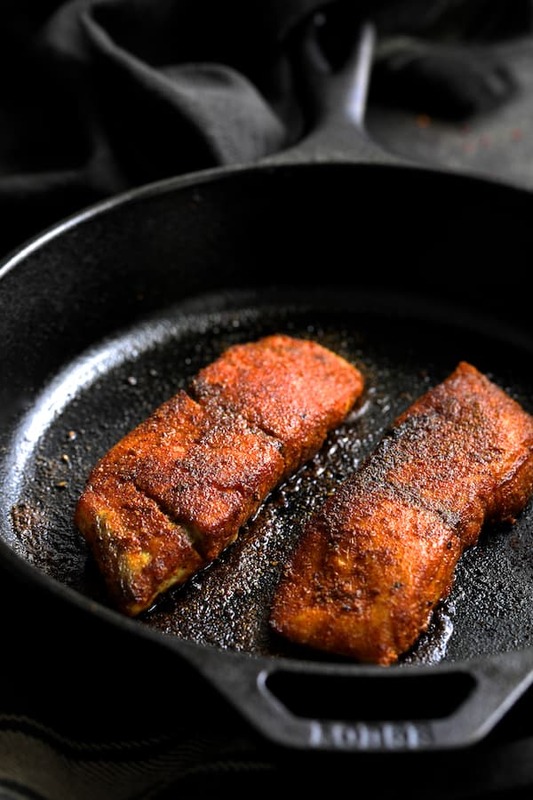 Almost any fish will work with this dish such as salmon, trout, grouper, cod, etc. I actually used barramundi which is an Asian sea bass but Chilean will work too! The fish is paired with a lively braised red lentil dish. 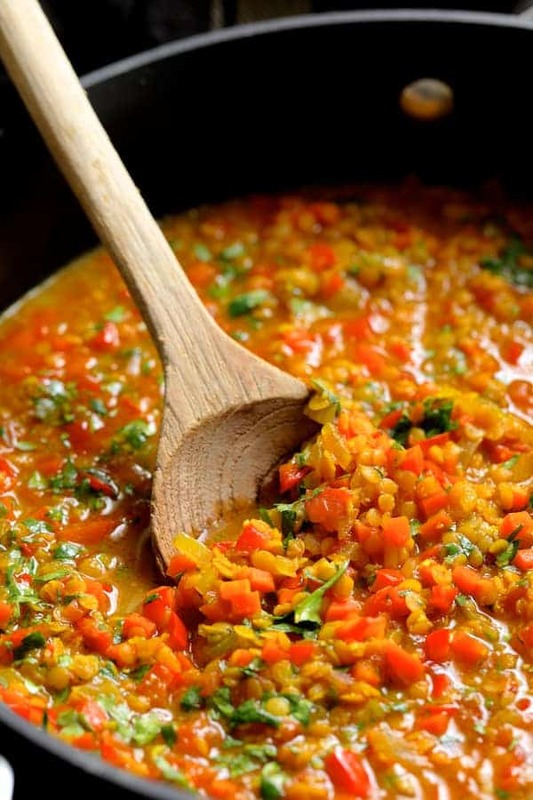 Red lentils, also referred to as pink lentils or masoor dal, cook much faster than brown or green lentils. 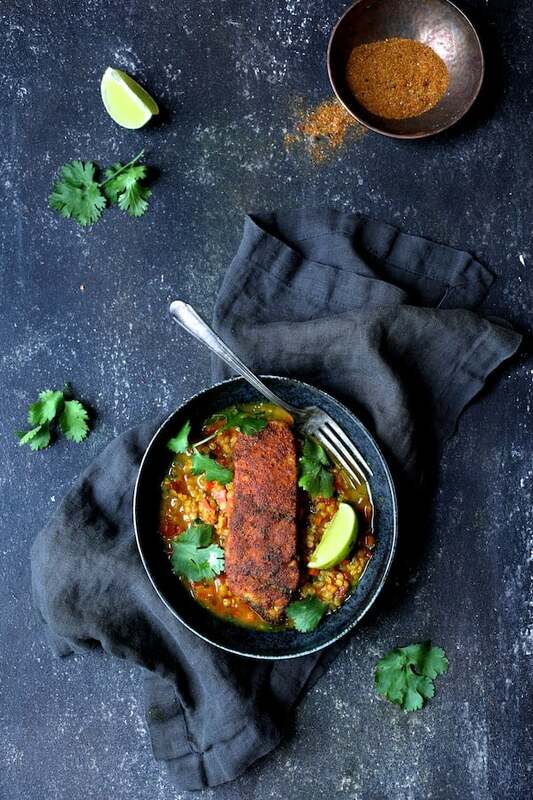 Besides the fact they cook faster, I love red lentils because they cook to a soft, almost sauce-like consistency which pairs well with a simply-prepared protein such as this fish. While you could certainly make your own curry powder blend for the lentils, I use a good quality blend from a local Indian grocery store. This dish is amazing as is, but a cooling raita or a dollop or two of yogurt is a lovely addition! 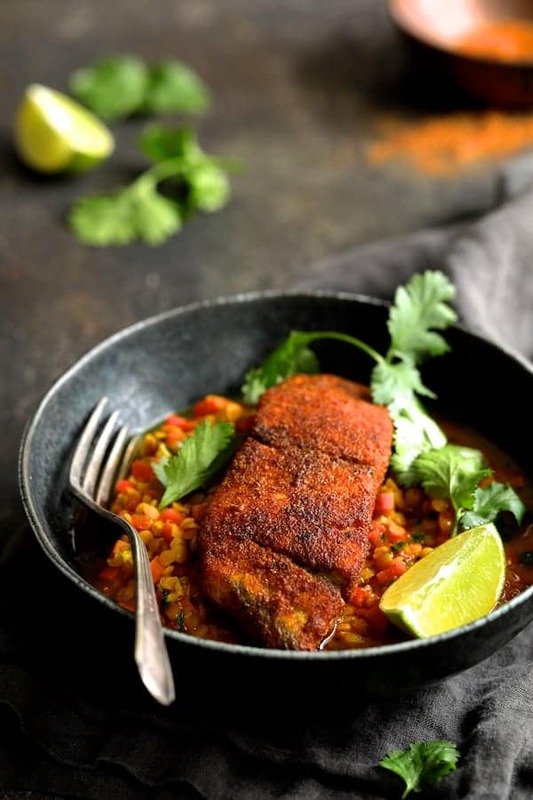 Indian Spiced Sea Bass with Braised Red Lentils! Garnish with lime wedges and cilantro sprigs, add a little bit of yogurt and you’ll forget all about the long month of January! Be sure to check out some of my other delicious Indian-inspired meals! LENTILS: Heat oil in a saucepan over medium-high heat. Add onion, then reduce heat to medium-low and cook 3-4 minutes or until it begins to soften. Add carrot and red bell pepper. Continue to cook 5-7 minutes or until vegetables are very soft. Add garlic, ginger and curry powder, stir several times and cook briefly or until fragrant (no longer than 30 seconds or these can burn). Add tomatoes and vegetable broth and bring to a boil. Add lentils, reduce heat to low and simmer uncovered 20 minutes or until lentils are very tender, adding more vegetable broth if needed. Add vinegar then season to taste with salt and black pepper. Stir in cilantro and serve with fish. 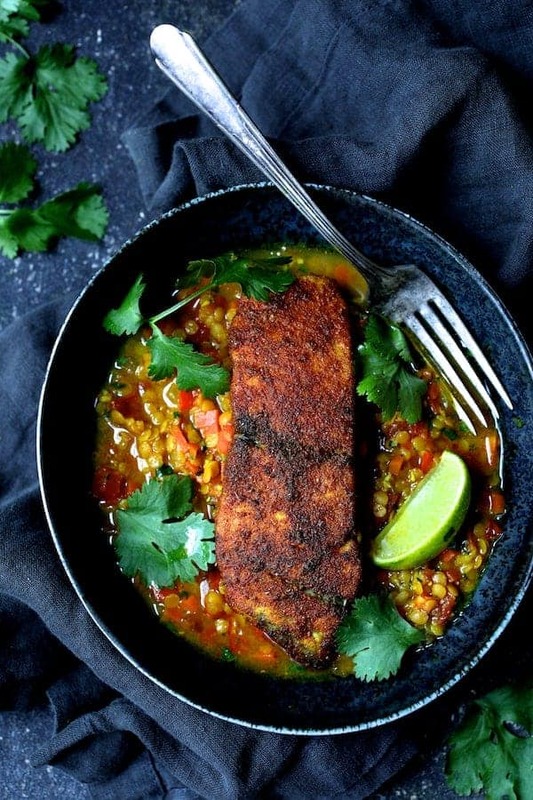 FISH: Prepare fish while the lentils cook. Preheat oven to 375 degrees. 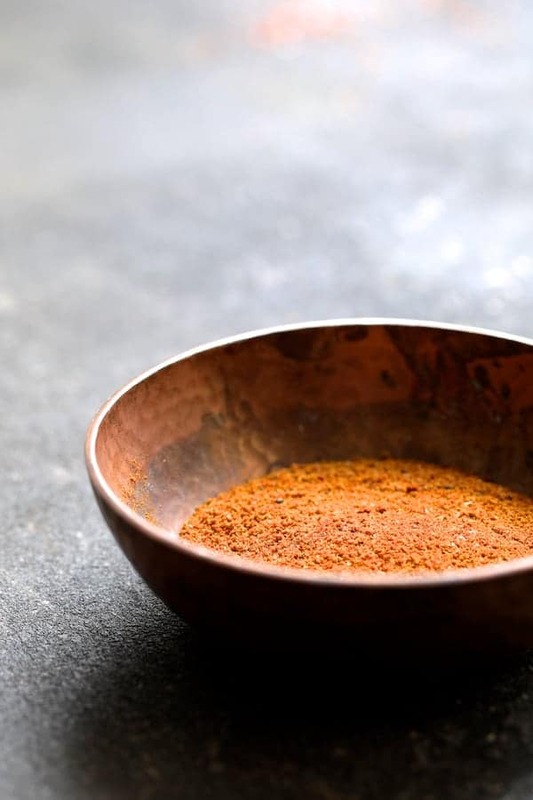 Combine paprika, cumin, coriander, turmeric, cayenne, black pepper and salt on a plate. Coat fish fillets well on all sides. Heat oil in a skillet or sauté pan over medium-high heat. Add the fish and cook 1-2 minutes per side. Transfer to the oven and bake 10 minutes or to an internal temperature of 145 degrees and fish easily flakes with a fork. Serve over lentils with lime wedges, plain yogurt and garnished with cilantro sprigs.